By the end of January, many students at Kennedy Community School were feeling healthier and happier. That’s because of the school’s annual month-long nutrition and fitness effort dubbed Fitness Fever. The program started Jan. 1 and lasted through the month, although fitness efforts persist throughout the year. Physical-education teacher Barb Gabler explained how the program works. All students are encouraged to eat five different fruits and vegetables per day. In classrooms, teachers often interrupt lessons so that students can get up and do some stretching exercises. Active play, at least an hour a day, is encouraged. On one night in January, there is Fitness Fever Family Night, and this time the theme was Surfing into Fitness with a Beach Boys’ beach theme. 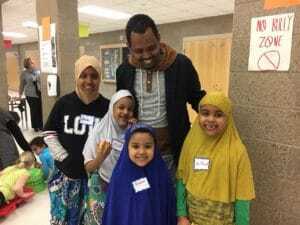 At the 90-minute fun night, parents, students and others danced up a storm and participated in all sorts of other fun physical activities. 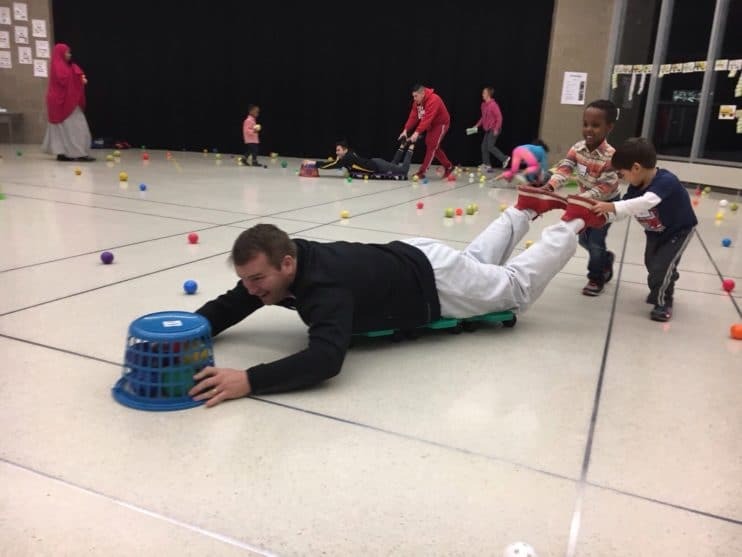 Gabler, who is one of the school’s three physical education teachers, started the annual fitness program way back in 1998. 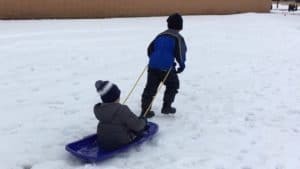 Throughout the years, she had students compile a list of alternative activities other than “screen time” (time spent gazing at TVs and electronic gizmos). Getting students to stay away from screen time becomes a bit more difficult every year, Gabler said, because electronic activities have become more and more prevalent in just about everyone’s life in recent years: TV, iPhones, computers and video games. Gabler is happy that progress has been made when it comes to nutrition. Children are encouraged to get exercise during Kennedy Community School’s fitness month. A family enjoys the activities at Kennedy Community School Jan. 15 during Family Fitness Fever. Fun in the gymnasium at Kennedy Community School Jan. 15 during Family Fitness Fever.